Roadeo, Roadeo, Oh Have You Met Roadeo? 1. Why does it look so unRivendellish? a. It IS steel, it IS lugged, it HAS a fork crown and a nice fork rake. You CAN fit a 35mm tire. 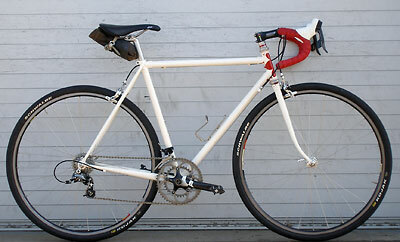 It has longish (by race bike standards) chainstays, and a lowISH bottom bracket. It has a clamp-on front derailer. All quite in keeping with all of our bikes. a. Done it before, with the Legolas. The Roadeo will be available threaded or threadless, same price, your choice. a. $2,000 frame and fork. And we’ll have some package options—likely a club-rider-racerish package with a road double and SRAM brifters for around $4,200; and a country-ish version, probably with a triple….for $3,600. Specs to be determined, but one racey, one normal….with mixitup flexibility, whatever one likes. a. white with red; white with blue; any color you like except white or cream, with cream. a. 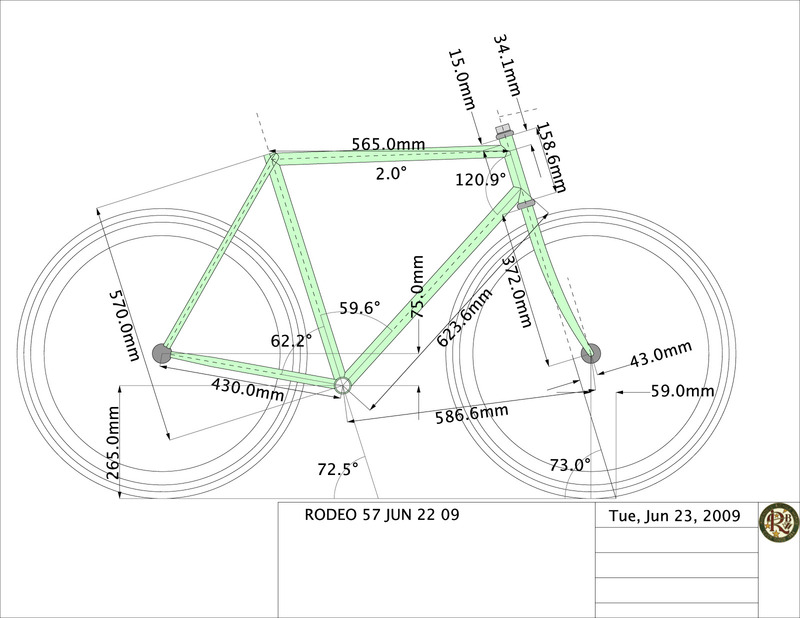 Well, man, the prototype frame here weighs 4lb 3oz, in a 55cm. Now, there are ways to trim another half pound off it, but not without getting super ridiculous. We’re shooting for 3.9999999999999xinfinity pounds, and think we can get there by trimming a lug, using a narrower crown, monkeying around with the chainstay brake bridge, possibly using a different bb shell and seat tube. But that’s it! Then it’ll weigh what it weighs, and it’s over. a. as shown, 20.7. with four ounces off the frame, three off the fork (we can do this easily on a threadless), and something else, we can get it to 19.9999999999999 pounds with Jack Brown greens. The best brakes for it are the Tektro Bigmouth 57s. They’re super light, and allow 35mm+ tires, releasable without deflating. The photo shows a SRAM crank–Mark picked all the parts for it–but we may go with a D/A compact. It’s all up to Mark (I just designed the frame). Eventually the particulars will go onto our site, but I hate taking about decimal metric numbers as though the decimals matter and the numbers reveal the essence of the frame. I don’t like stubby chainstay even a little, but I don’t want my preference for 44.5+cm chainstays to smite this bike before it leaves the gates, and in the big pic 43/43/5 is plenty fine, and if it works for Mark, it’ll work for anybody. The rest of the numbers are right down the middle of our lane, with a slight Mark-’fluence, because Mark has that ‘fluence, and he knows. I may get a 59, so I jogged a little with the numbers for the 59, designing it just for me, but it’ll be fine for anybody who fits it. I think the bb is a few mm lower than the 57 and the 61—77 or 78 instead of 75. Not significant, but it’ll allow me the clearance I want with the fatties I’ll ride on it. Club riders who weigh under 210l bs and who aren’t looking to load it up or ride it on trails. We have other bikes for that, and the Roadeo is for road riding with minimal gear. There are no rack eyelets (reinforces the message) but there are fender eyelets on the dropouts. ANYBODY is welcome to come by and ride it, and we should have another prototype in a month or so. Maybe another Mark’s size, or maybe mine, not sure. It is every bit as zippy as any road bike, and a lot more useful, comfy, safe…and lower priced than a lot of them..
August 14th, 2009 at 10:23 am Dude! Pitch-perfect. Thanks for posting this, Jim! August 17th, 2009 at 9:25 am Jim that’s a winner, and I bet it proves to be a big seller for Riv. 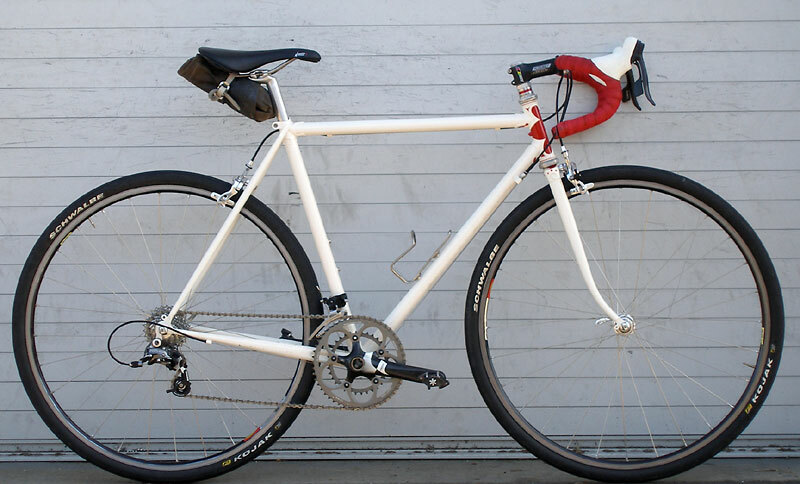 BTW, except for the brake reach, its just like my Riv I had built in 01 (spec’d as a racy, comfortable, light, frame to be equipped with a road double. My frame has 753 and 725 tubing, and its very light for steel. August 21st, 2009 at 6:27 am Rad! Thanks for posting! August 26th, 2009 at 3:34 pm Other than lugged in construction and mini-grams lighter in tubing, what is the advantage over a Surly Pacer? That question posed, I’m still a huge Rivendell fan! August 26th, 2009 at 9:29 pm Beee-u-tee-ful!! August 27th, 2009 at 8:49 pm Nice. Sort of like a Rivendell RB-1 if you will. I always wondered why Rivendell didn’t make something like this. Now they are. Very cool indeed. August 28th, 2009 at 7:31 am I’m really hoping that the next prototype is in Grant’s size, as that would roughly be mine as well. Of course, as I think about it, while that would be a good thing, it certainly wouldn’t be a safe thing. Regarding the geometry vs other models. Here’s a small version of the Roadeo Prototype Geometry. Click for a large size image. I haven’t ridden a Pacer, so I’m not sure how those handle. The only Surly I’ve spent time on was a Cross Check. Certainly, they are made with similar ideas in mind. I think the small differences in geometry is one of the things which makes a GP-designed bike ride so well. 4130 steel on the Surly, though it is double-butted in the mainframe. It will be interesting to see. 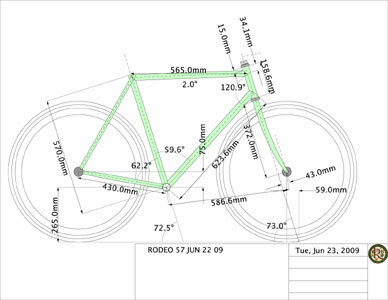 September 3rd, 2009 at 3:05 pm Looks great, like the tire clearance and design priorities… BUT, $2000 for production frame/fork, and $4200 for a complete bike?!? Eep. o_0 Not to piss in Grant’s cheerios, but you can get custom steel for that price, fitted perfectly for YOU, your choice of lugs, paint, geo, etc. etc. I like it, but it just doesn’t seem competitive price-wise, no matter what GP says. Too bad, because its the kind of bike I’d want, design-wise. September 3rd, 2009 at 3:52 pm Well, I’m sure everyone has their price threshold. There aren’t that many builders who are skilled at lugged framework. I look at the production frames from Waterford, which less attractive design to my eye - you can get an R-22 for $1800. Of course, you need to buy a fork, which adds another $350 if you want steel. So, for $150 less, you can get a Rivendell, with a fork, contrasting paint, etc. For a US-made, Grant-designed frame, I think it’s appropriate. It definitely has a very specific design tenet, as described above. I don’t think he intended it to compete (if that’s even a valid consideration) with custom builders. Compared to the single-purpose stuff I see sitting on the LBS’s floor with $4K - $9K price tags on it, I think it’s a much better value. Again, I think there’s nothing wrong with saying it’s not the bike for you. But, I do think it’s a pretty exciting model. September 3rd, 2009 at 7:14 pm The comparison is not production Waterford vs Roadeo… which is really comparing Waterford to Waterford, since that’s who’s making the Roadeo for Grant. The comparison is custom steel vs Roadeo, and again, you can get a very nice CUSTOM steel lugged frame & fork for what GP wishes to charge for production. Nothing evil about that, GP can charge what he wants and he’ll get some takers no matter what, but I can definitely see how the value proposition is not of the best, and will be off-putting to some. September 3rd, 2009 at 10:34 pm Well, I don’t agree with your first point. It’s a Rivendell design, not a Waterford. I was using the Waterford as a reference as generally people do not state their frames are overpriced. Yes, the $2,000 price level does make custom options viable. But, I think that someone who feels they need a customer is probably not weighing it against any “off the rack” model. I would guess that the Roadeo was created for folks who have ridden Grant-designed bicycles and like the way they ride. September 4th, 2009 at 12:59 pm The $4200 for a complete double-crank ‘club’ build is a bit high. Would be nice to see a ‘budget’ double build. Something like SRAM Rival, DT 1.1 or Open Pro rims, ‘good value’/’sweet spot’ parts elsewhere. Come in around $3500. In this economy, couldn’t hurt. September 4th, 2009 at 8:17 pm I wouldn’t want to speak for them, as it is Riv’s bike, but in the past when I’ve dealt with them, swapping parts in and out has not been an issue. They’ve always said they’d work with someone’s budget on component spec’s. I think the catalogs usually say something to that effect - “tell us if you need to stay under X dollars” or something along those lines. I’d give them a call if you wanted to save some money on the build. September 28th, 2009 at 2:27 pm Just noticed… there are NO DOWNTUBE SHIFTER BOSSES on the finalized Roadeo. What the heck, Grant? FAIL. September 28th, 2009 at 2:42 pm There were a few threads regarding this on the RBW Owner’s Bunch discussion group. He actually replied directly to that concern in the thread. Ahh… here is his post. I don’t know how many club riders are going to run DT shifters on a rig like this, so it didn’t seem like an issue to me.